LTHForum.com - Happy Pi Day! 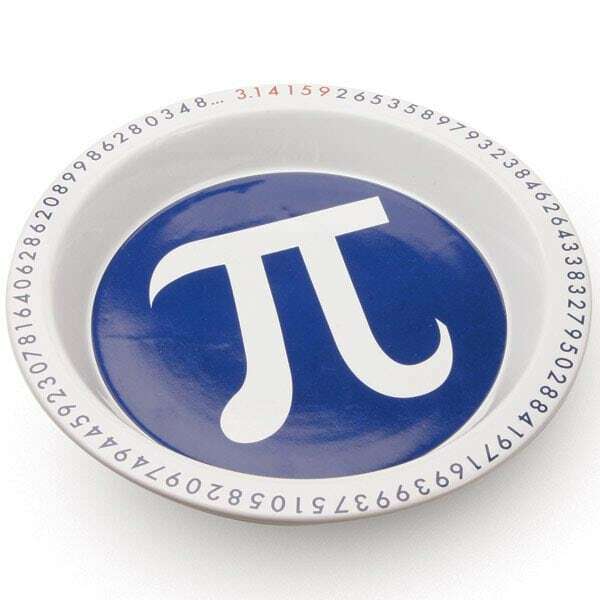 LTH Home > Chat > Other Culinary Chat > Happy Pi Day! I get it. 3.14 ... There is an educational website devoted to honoring this day. What did you do for the 300th anniversary of pi in 2006? I'll bet that was one heck of a party. Most restaurants sell pie only by the slice. To find out how much it would cost to buy an entire pie, multiply the number of slices by the value of pie, which is currently $3.14159265358979323. I was in Big Lots today where I found Kellogg's cereal sipping straws on the shelf. It could be an overrun or you may want to get your cereal sipping straws before they fade away. Steve, B wants a slice of that pi. Cathy, I will be stopping by Big Lots this week. Last year B said to me, "I hate math, dear Pater." My heart sunk to its depths. And then I got angry. Anger turned to indignation. "You, dear child, are a Ramon. Ramons love math." I could tell from her visage that she was not convinced. I tried the usual spiel about how you need math to do anything of consequence. I was losing my argument. "Math is beautiful, elegant, pristine, and heavenly. Math is a grand puzzle, the symphony of the universe. Math is magic." I then preceded to tell her about the wonders of pi. She was so fascinated, we talked about it every night for two months. The t-shirt was part of this project. We've gone on to talk about Avogadro's number, imaginary numbers, and the Fibonacci sequence, as well as others. She has not expressed her hatred of math again. 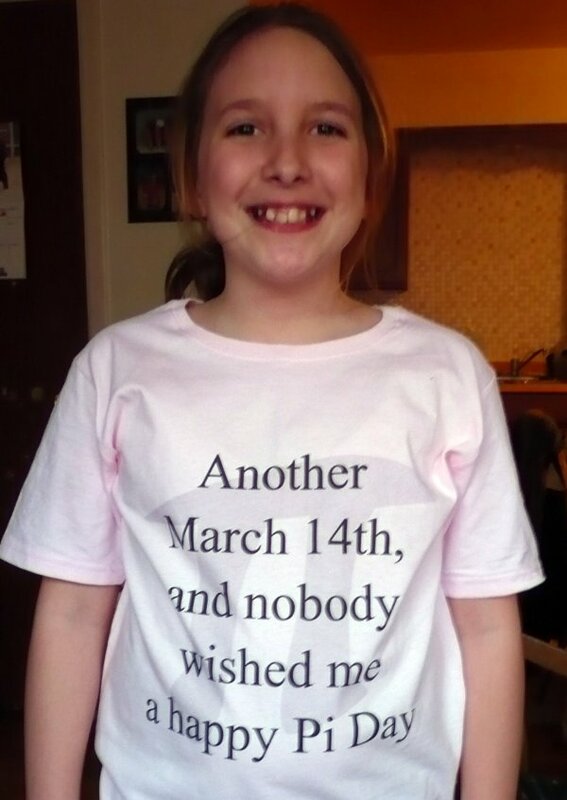 I hope the t-shirt still fits her on the next Pi Day. Last edited by Ramon on September 21st, 2008, 9:50 pm, edited 1 time in total. I commend you in your effort to reverse the negative connotations of math. I once saw a neighbor's child blanch when I explained math was something one used every day. She wasn't a very successful student and likely prayed for the day she never needed to think about math again. It never occured to her it was an important life skill. She is now an artist. Happy Pi Day again, to you all! I celebrated the day with a slice of pecan pie at Depot Diner. A Happy Pi Day to B. Hope she's still fascinated with Math! In an apt demonstration of the principle of Relativity, as propounded by Galileo, the bawdy platter, and the steaming morsels thereon, remained in the same position vis-a-vis Daniel, and hence were, in principle, just as edible, as if he had been seated before, and the pies had been resting upon, a table that was stationary with respect to the fixed stars. This was true despite the fact that the carriage containing Daniel, Isaac Newton, and the pies was banging around London. Daniel guessed that they were swinging round the northern limb of St. Paul's Churchyard, but he had no real way of telling; he had closed the window-shutters, for the reason that their journey to Bedlam would take them directly across the maw of Grub Street, and he did not want to read about today's adventure in all tomorrow's papers. Isaac, though better equipped than Daniel or any other man alive to understand Relativity, shewed no interest in his pie - as if being in astate of movement with respect to the planet Earth rendered it somehow Not a Pie. But as far as Daniel was concerned, a pie in a moving frame of reference was no less a pie than one that was sitting still; position and velocity, to him, might be perfectly interesting physical properties, but they had no bearing on, no relationship to those properties that were essential to pie-ness. All that mattered to Daniel were relationships between his, Daniel's, physical state and that of the pie. If Daniel and Pie were close together both in position and velocity, then pie-eating became a practical, and tempting, possibility. If Pie were far asunder from Daniel or moving at a large relative velocity - e.g. being hurled at his face - then its pie-ness was somehow impaired, at least from the Daniel frame of reference. For the time being, however, these were purely Scholastic hypotheticals. Pie was on his lap and very much a pie, no matter what Isaac might think of it. Not gobbled entire by One Man! The movie Night at the Museum: Battle of the Smithsonian has some 3.14159265 in it. I know the kids don't read this board, so the secret is safe. B asked her math teacher if they could celebrate Pi Day a week or two back. He admitted he always wanted to, that he probably should, and that this was a good year to start. While Pi Day is on my Blackberry calendar, B was planning ahead of me. Monday of last week, B told me this and said she wanted to bring in a Pi Pie to school. I asked, what kind. She said, Oreo. I must admit I was a bit of askew that she was a head of me in planning. Her old T-shirt is long gone. No time to order a new one. And then I forgot about the whole thing. Thursday morning, over breakfast, she reminded me again. I said I had no idea how to make an Oreo pie. She said Baker's Square has them. Though there is a Baker's Square close to my abode, I have never thought of setting foot in there. Sure enough, they had a(n) Oreo pie, ready to go for me in seconds. I asked about Pi Day promotions and was met with blank looks. No award winner, but it filled the bill with aplomb. B said it was the best tasting, and only decorated Pi Pie of the bunch. Her teacher produced related Pi based math lessons, vowed to repeat such next year, and all had a good time. Pi Day and MIT admissions. Illinois Science Council lists venues celebrating Pi Day. "I know it will be called blasphemy by some, but I believe that pi is wrong." That's the opening line of a watershed essay written in 2001 by mathematician Bob Palais of the University of Utah. In "Pi is Wrong!" Palais argued that, for thousands of years, humans have been focusing their attention and adulation on the wrong mathematical constant. Two times pi, not pi itself, is the truly sacred number of the circle, Palais contended. We should be celebrating and symbolizing the value that is equal to approximately 6.28 — the ratio of a circle's circumference to its radius — and not to the 3.14'ish ratio of its circumference to its diameter (a largely irrelevant property in geometry). Last year, Palais' followers gave the new constant, 2pi, a name: tau. Since then, the tau movement has steadily grown, with its members hoping to replace pi as it appears in textbooks and calculators with tau, the true idol of math. 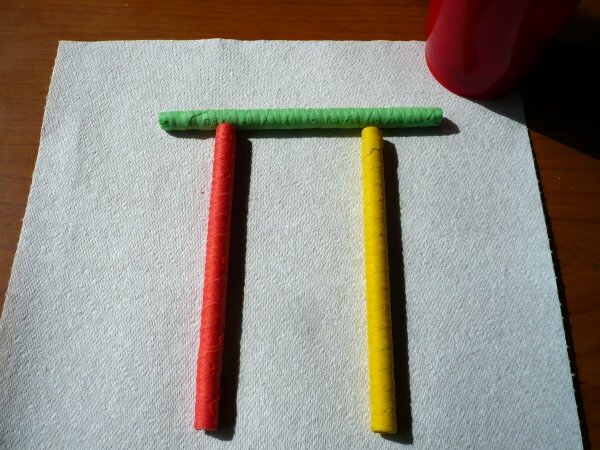 Yesterday — 6/28 — they even celebrated Tau Day in math events worldwide. Tau! You can't cook that! If Tau is 2Pi, you can make two pies for every Tau. It works, if you want it to. 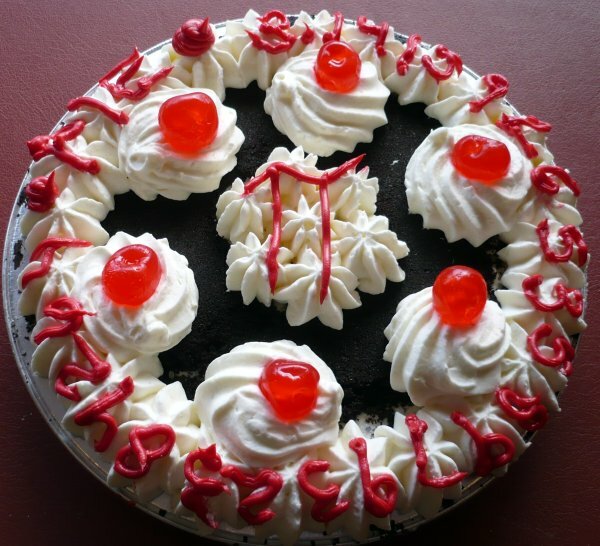 In anticipation of Pi Day this week and noting that this month’s Dessert Exchange had the appropriate theme, how do you plan to celebrate the day? Sweet or Savory Pies are acceptable. I am going to look through my files for something I haven’t tried before and see what takes my fancy. pairs4life wrote: In anticipation of Pi Day this week and noting that this month’s Dessert Exchange had the appropriate theme, how do you plan to celebrate the day? Bang Bang on Damen stayed open late, got a piece of lemon bar pie. Really enjoyed it. Gooey at the point, more solid towards the edge. A nice sprinkling of sea salt. I think the menu said lavender, didn't really notice any flavor from that, but did some something that looked like bits of lavender. I ate my leftover honeycomb pie from LauraS. Even better the third day!